From breakfast to dinner, dusk to dawn, children will love spending the day with this curious penguin chick. In the latest volume of Ella Bailey’s picture book exploration of the daily lives of baby animals, we head to the ice shelf to meet a young penguin chick. What does she and her family eat? How many brothers and sisters does she have? What do they do for fun? 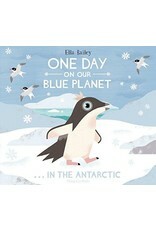 Ella Bailey is an illustrator and writer who graduated from Falmouth University. She lives in Nottingham, where she spends her days drawing every animal she can think of.